This year, Ram is coming out with many new special edition trucks. Some old favorites are getting a new paint job where others are getting the good ol’ car face-lift. So enough stalling, let’s dive right in! Made for hunters and fishermen alike, the Outdoorsman is a versatile truck. It’s equipped with: four doors, six-passenger capacity, and four-wheel drive. So, what can make it better? The Mossy Oak Edition, that’s what. Possibly the most unique truck in the Ram lineup, the Ram Outdoorsman is available with a 3.0-liter V6 EcoDiesel engine, with a maximum towing capacity of 10,160 pounds. Plus, with under floor storage bins, 17-inch wheels, and the RamBox cargo storage system, all your hunting gear is ready to go. Are you? Just like it says in the name, this truck is like the night – all black. The truck is black, the grille is black, the headlights are black, and the rims are black. 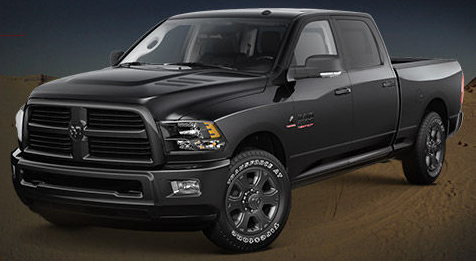 Heck, even the Ram insignia is blacked out. It makes for one sleek-looking pickup truck. The only thing making it better is a 5.7L Hemi V8 engine that generates up to 395-horsepower and 410 lb-ft of torque. Like the Outdoorsman, the Midnight Express trim is fitted with extra storage systems for all the necessary cargo. It has a towing capacity of 10,650 pounds, and a payload of 1900 pounds. 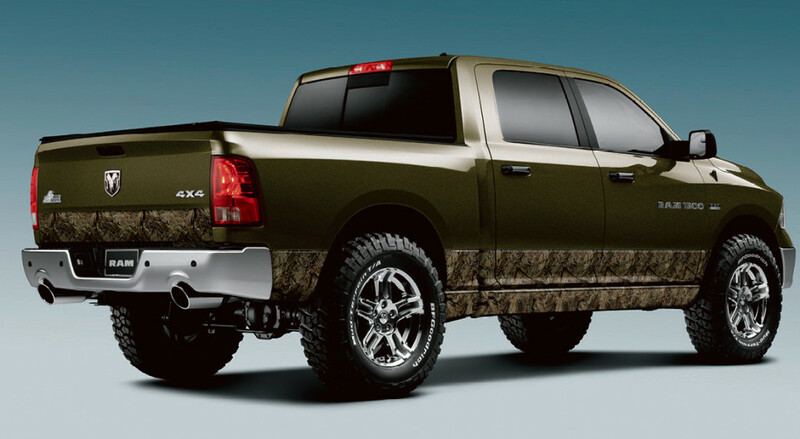 The Ram Rebel is already a special edition truck in the Ram lineup. 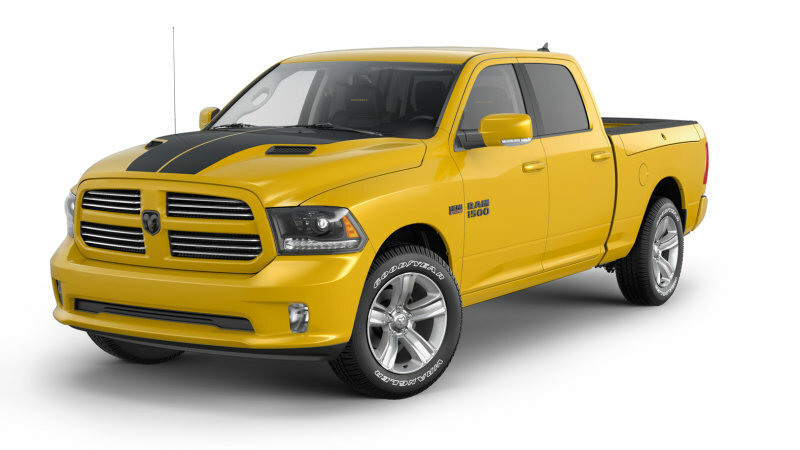 Powered by, you guessed it, a 5.7L HEMI V8 engine, the Ram Rebel stands out among its siblings. Rolling on 17-inch cast-machined wheels and wearing a bold Ram grille, it’s no wonder the Rebel is already sought after. So what did Ram do? They paired up with Mopar’s talented design team and went to town. It now has black wheel flares, a Mopar blue streak along the side, a black front bumper skid plate, Mopar graphics of course, drivers can request a cat-back exhaust and cold air intake for increased performance and rugged sound. The Ram 2500 Laramie a well-known truck in the lineup, able to tow up to 17,510 pounds. One would never think of this as a “sports” vehicle. It seems more like a tool for the driver that needs to get things done. Ram knew they needed to give it a little more style. Like some of its brethren, they’re painting it all black. Like the Midnight Express, it’s black-on-black-on-black. Black premium LED tail lamps, black power foldaway mirrors, black badges, and 20-inch black painted aluminum wheels. Plus, they’re throwing on some on/off-road tires to give it an extra layer of toughness. 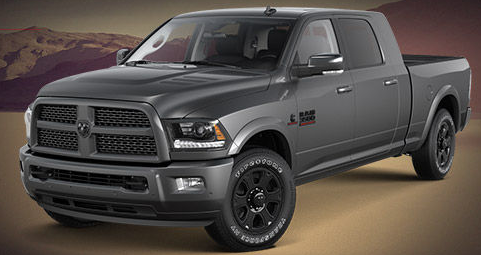 The Big Horn is one of Ram’s heavy duty trucks, and is sibling rival to the Laramie. 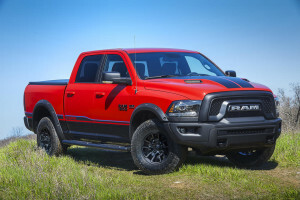 Both trucks share a towing capacity of 17,510 pounds and have the popular 5.7L Hemi V8 engine under the hood. Why not make them twins? With the black appearance group, that seems like the plan. The Big Horn Black will also get black bumpers, 20-inch black painted aluminum wheels (this time with black center hubs), black headlamp bezels, black badges, and more. It’s also available with a rear back-up camera, a piece of tech the Big Horn hasn’t had before. Earlier this year this special edition truck made heads turn with its distinctive yellow paint job. It was a follow up to the Texas-only special edition “Yellow Rose of Texas.” Also powered by a HEMI V8, riding on 22” wheels, the Stinger’s bold exterior highlighted with black chrome and yellow details made it stand out. Mopar got in on this project for the Sport package and branded its hood with the Mopar Decal. The Yellow Stinger won’t fall to the popular black paint job, it will keep it’s sunshine yellow. 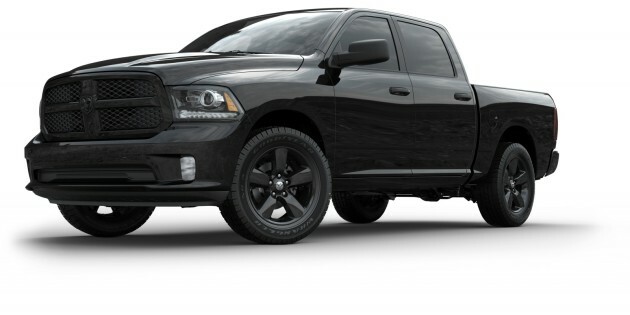 It will however get flat black badging and a black Ram head on the tailgate. Plus, the Yellow Stinger is riding on 20” aluminum wheels with all-season outlined white letter tires. This baby isn’t even out yet and it’s already a special edition. Coming to the streets in the fall, the Ram Power Wagon is decked out with so many goodies, it’s a truck driver’s dream. The 2017 Ram Power Wagon will have blacked-out headlights, an all new grille, and a hood decal exclusive to the Power Wagon. Like the Mopar special-edition truck, the name “Power Wagon” will be all over the truck. It will be powered by the Rebel’s engine, a 6.4L HEMI V8 engine, that gets 410-horsepower with 429 lb-ft of torque. Plus, 33-inch Goodyear all-terrain tires for on and off-road action, and a 12,000 pound winch is installed behind the front bumper. That’s all we’ve got for now, but who knows before the end of the year. Be on the lookout and tell us what you know about these special editions on our social media.